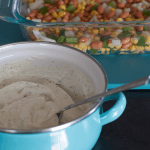 Quick & easy mexicorn dip is so tasty. 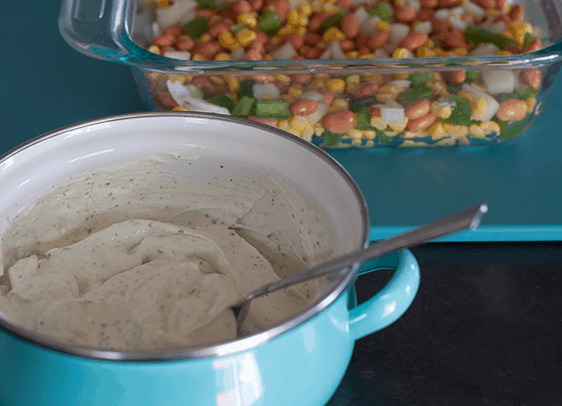 It will be your new go-to dip recipe for potlucks and barbecues. Hello and welcome! 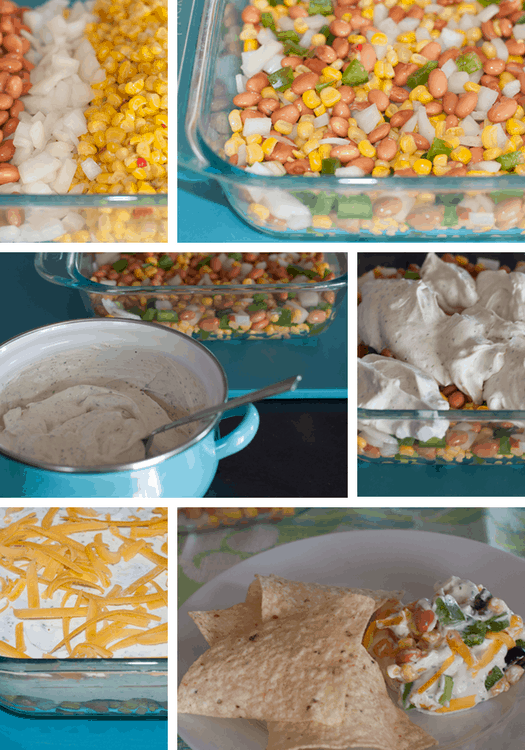 Today I’m sharing a quick and easy mexicorn dip. 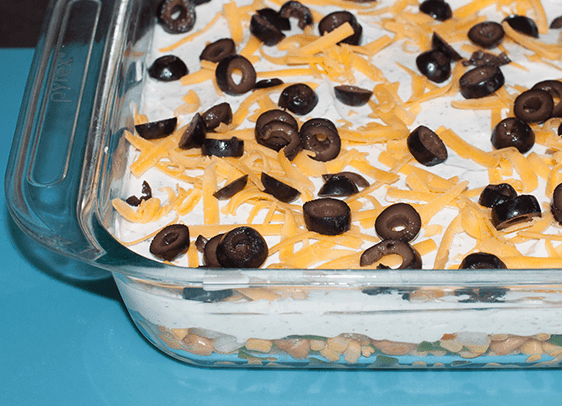 This layered dip is so good, it’s almost addicting. Believe me, if you introduce it to your friends and family, you will have many requests to make it again! 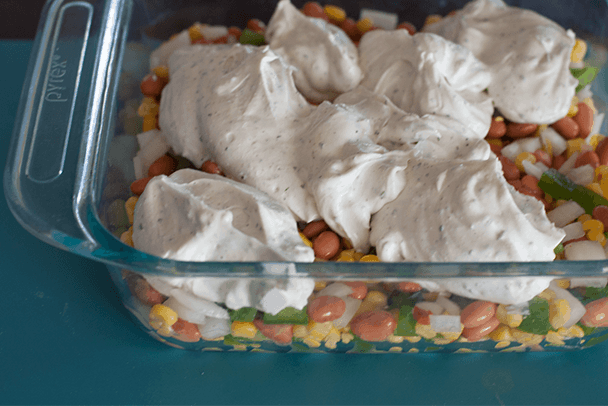 This recipe starts with a colorful bottom layer of pinto beans and veggies topped with a ranch dip mix and sprinkled with freshly shredded cheddar cheese and black olives. I use an 8x8x2 glass baking dish. It takes about 15-20 minutes to prepare and feeds approximately 12 people. If you’re planning to make it for a larger gathering, double it and use a 13x9 pan. Green Giant makes a can of mexicorn called Steam Crisp Mexicorn (whole kernel corn with red and green bell peppers). Start by chopping the green pepper and onion into small chunks. Add both to an 8x8x2 glass baking dish. Drain the mexicorn and pinto beans. I normally rinse the pinto beans so the dip doesn’t get watery. Add to the green pepper and onions. 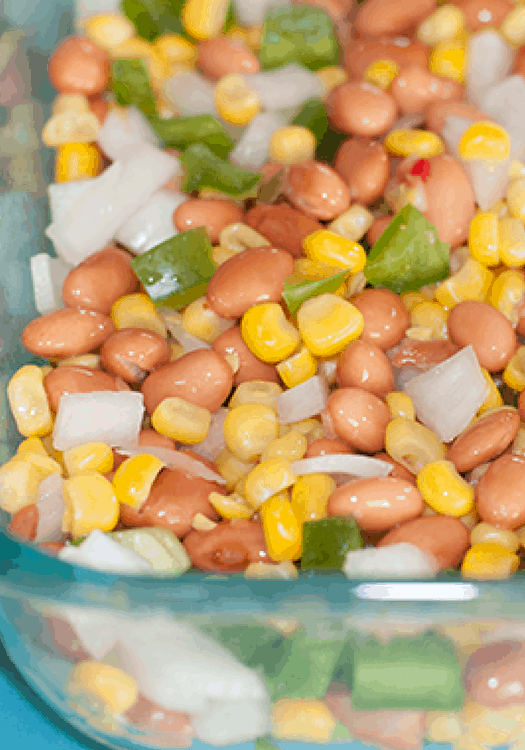 Mix the pinto beans, onion, green pepper, and mexicorn. In a separate small bowl, mix the sour cream and ranch dip seasoning. 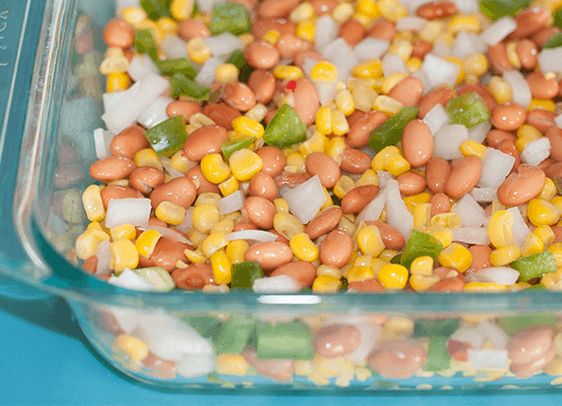 Drop spoonfuls of the ranch mixture on top of the pinto bean, green peppers, mexicorn, and onions. 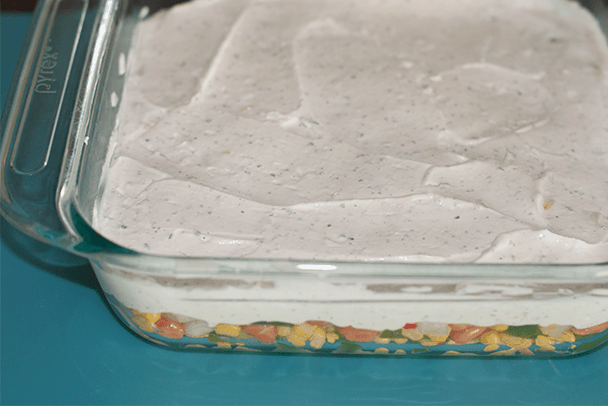 Spread the ranch mixture over the first layer — like you are frosting a cake. Top with 1/2 cup shredded cheese. I like to use freshly grated cheddar cheese. Sooo good! Sprinkle with sliced black olives. I’m an olive freak so I add an entire small can. For the best flavor, chill in the fridge for a few hours before serving. When you’re ready to serve, pair with tortilla chips. 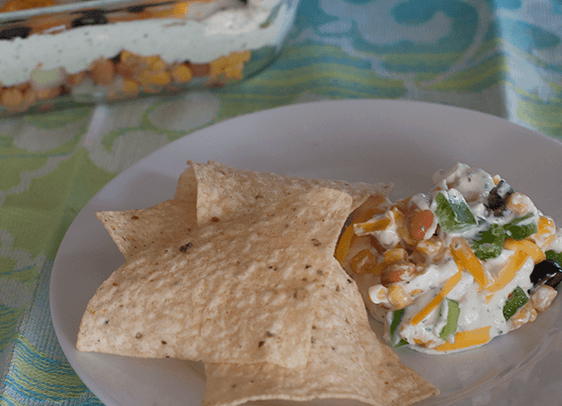 Quick and easy mexicorn dip recipe paired perfectly with tortilla chips. Great for summer picnics, BBQs and game days. Start by draining the mexicorn and pinto beans. (Rinse the pinto beans as well so the dip doesn’t get watery.) Add both to a 8x8x2 glass baking dish. Next, chop the green pepper and onion into small chunks. Add to the pinto beans and mexicorn. 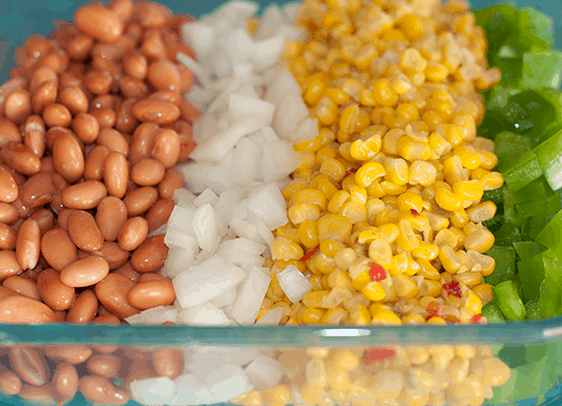 Mix the pinto beans, onion, green pepper and mexicorn. Drop spoonfuls of the ranch mixture on top of the first layer. Spread the ranch mixture like you are frosting a cake. 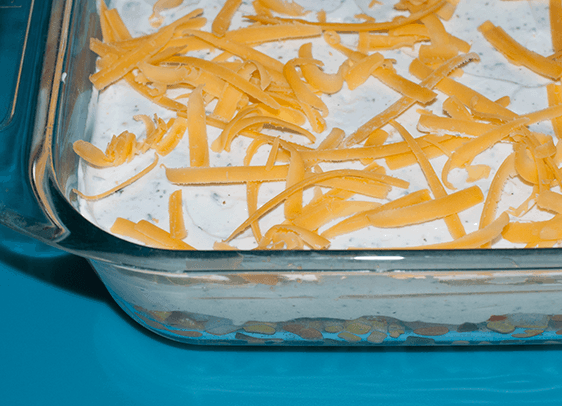 Spread one 1/2 cup shredded cheese on top of the ranch layer. I like to use freshly grated cheddar cheese. Sprinkle with sliced black olives. AND be prepared to share the recipe! Your friends and family will love it! You can also add diced tomatoes to the first layer. Thank you for stopping by to check it out! Enjoy!